Health care is a growth industry in the U.S. and the United Kingdom, and the trend is expected to last for the foreseeable future. This is due to the aging populations in these countries, which will naturally result in strong demand for healthcare services. Investors can capitalize on this huge demographic trend through Real Estate Investment Trusts, or REITs, that own healthcare properties such as senior housing, and other medical facilities. Higher demand for healthcare properties is likely to provide a long-lasting growth tailwind for REITs in this industry. Welltower (WELL) is a healthcare-focused REIT, that has an attractive dividend yield of 5.3%, and has attractive growth potential. Welltower a healthcare REIT. It invests in properties such as senior housing, post-acute communities, and outpatient medical properties. It has a diversified portfolio, consisting of over 1,200 properties spread across the U.S., Canada, and the U.K. Approximately 72% of Welltower’s portfolio is comprised of senior housing, including independent living, assisted living, and memory care facilities. Another 11% of Welltower’s properties are in long-term, post-acute care, with the remaining 17% consisting of outpatient facilities. Welltower has a market capitalization of $25.4 billion. The company’s strategic focus in the U.S., its largest market, is to acquire properties in urban areas, with high barriers to entry. Welltower focuses on the most attractive markets when selecting investment properties for purchase. Specifically, it looks for densely-populated urban areas with strong economics, and under-served markets. Some of its most valuable properties are located in New York, Seattle, Toronto, and Los Angeles. Welltower significantly restructured its portfolio in recent years. For example, in 2010, 69% of Welltower’s operating profit was derived from private-pay sources. 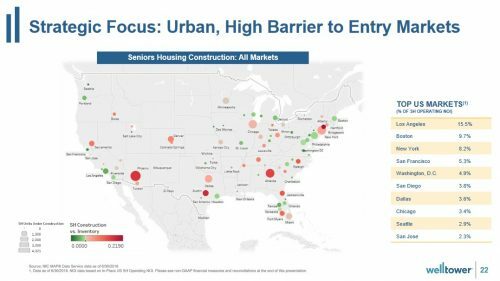 Currently, it has expanded its senior housing portfolio, which has elevated its exposure to private-pay sources to 95%. Welltower’s portfolio restructuring has worked well for the company. Revenue increased 4.8% over the first half of 2018, driven by higher resident and service fees. Funds from operation, or FFO, declined by 0.6% in the most recent quarter, but the company has positive growth prospects this year and beyond. For 2018, Welltower expects same-store net operating income growth of approximately 1.0%-2.0%. Life expectancies are rising in developed markets like the U.S., Canada, and the U.K., which should lead to sustained growth opportunities for Welltower moving forward. Welltower expects the 85+ population will double over the next 20 years. In the U.K., the company expects the 75+ population will grow at five times the total population through 2038. In Canada, the 75+ population is expected to rise at 9.7 times the rate of the broader population in the same time. Aging populations will result in higher demand for healthcare properties, which will provide Welltower with a growth tailwind for many years. 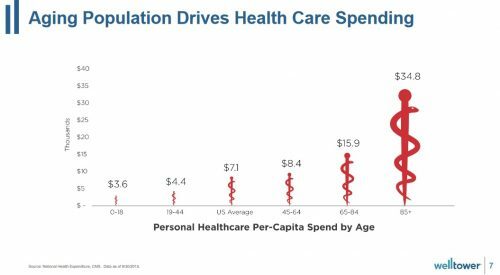 In addition to aging demographics, healthcare spending is rising as a percentage of GDP. According to Welltower, per-capita spending in the 85+ age group is expected to exceed $34,000 per year. This is more than double the level of per-capita spending for the 65-84 age group. From 2018 through 2038, the 85+ population is expected to rise by over 90%. Meanwhile, the 25-34 age group is barely expected to grow at all. This data point shows the immensely powerful demographic shifts that are expected to fuel Welltower’s growth over the next 20 years. Welltower will utilize acquisitions to boost its growth. On July 26th, Welltower and ProMedica, a not-for-profit healthcare system, announced a joint venture acquisition of Quality Care Properties, Inc. (QCP) and its principal tenants, HCR ManorCare and Arden Courts, the nation’s second-largest provider of post-acute services and long-term care. The $4.4 billion acquisition will give Welltower an even bigger presence in post-acute care. Such a high rate of growth among older generations, and the resulting need for healthcare properties bodes well for Welltower’s FFO growth, and by extension, its dividend growth as well. The most attractive aspect of buying REITs is that investors typically collect high dividend yields. Welltower is no exception, as it has a current dividend yield of 5.3%. This is more than double the average dividend yield of the S&P 500 Index. And, Welltower’s dividend is secure. The company currently pays an annualized dividend of $3.48 per share. Meanwhile, the company expects normalized FFO per share in a range of $3.99-$4.06 per share. This means Welltower is likely to generate more than enough FFO to sustain its current dividend payout, and future FFO growth will provide the opportunity for dividend increases. Importantly, the balance sheet is in good condition. Welltower has a credit rating of BBB+, which is a fairly high credit rating for a REIT. It also has an average debt maturity exceeding 7 years. A high credit rating and balanced maturity schedule will help lessen the impact of rising interest rates, which are a considerable risk for REITs. With a yield above 5%, Welltower is an especially attractive stock for investors interested in generating income from their investment portfolios, such as retirees. Welltower also has a long history of steady dividends. It has paid 189 consecutive quarterly dividends, a streak amounting to over 47 years. While high dividend yields are fairly common when it comes to REITs, not all REITs are worthy of investment. Investors should make sure their REIT dividends are sustainable over the long term. Welltower isn’t the highest-yielding REIT out there, but it is a high-quality REIT with growth potential. The fundamentals of the healthcare real estate industry are highly attractive for investment. REITs give investors the opportunity to invest in real estate, without having to actually own physical properties. In particular, healthcare real estate is a growth industry. Welltower has a strong business model and property portfolio. The joint venture acquisition should help accelerate growth alongside the changing demographics. Welltower’s current dividend payout is sustainable, and has room for future increases. Sure Dividend helps investors systematically find the highest expected total return securities using the Sure Analysis Research Database.